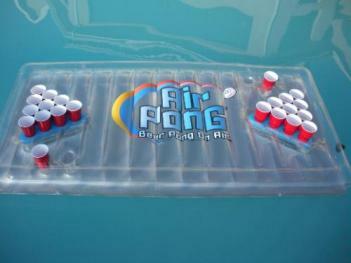 Pool Pong is an inflatable floating beer pong table that you can use in the pool. 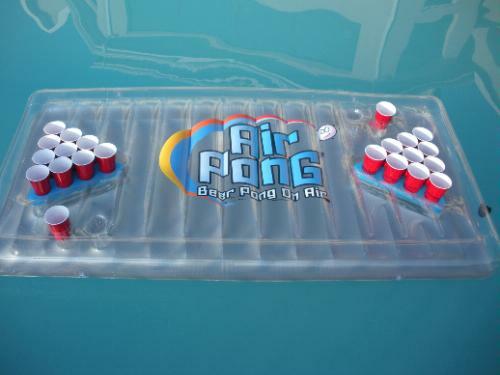 The inflatable beer pong table is 6 feet long and 2 feet wide, comes with 2 cup racks, and has seperate cup holders for your mixed drinks or water cups (although, I'm not sure why you would need a water cup... I don't think you need to wash the ball off when you are surrounded by water). Stop worrying about spilt drinks, dirty balls, and people puking, it's not your pool.